This edition of the Perfect Player series focuses on body and size among LeBron James, Giannis Antetokounmpo, and Anthony Davis. Selected by New Orleans with the 1st overall pick in the 2012 NBA Draft. • The Player of the Week honors marked the fifth of Davis’s career…Recorded his 1000th career block vs. BKN (10/26), becoming the fifth youngest player in NBA history to do so (25 years, 229 days). • Averaged 13.5 points, 8.2 rebounds, 1.8 blocks, 1.2 steals and 1.0 assists in 64 contests (60 starts) en route to being named to the 2012-13 NBA All-Rookie First Team • Led the team (or tied for the lead) in scoring 10 times, and in rebounds 20 times • Led all rookies in rebounds per game (8.2), blocks per game (1.8), steals per game (1.2) and double-doubles (20) • Ranked fourth in points per game (13.5) among all rookies • Recorded six performances of 20-plus points/10-plus rebounds • Recorded 20-plus points 10 times, and double digit points in 44 contests • Recorded double-digit rebounds on 23 occasions and five-plus blocks twice • Led the team with 21 points while adding seven rebounds, one steal and one blocked shot vs. SAS (10/31) in season opener. • In four starts with New Orleans against GSW in the 2015 Playoffs, Davis averaged 31.5 points, 11.0 rebounds, 2.0 assists, 1.3 steals, and 3.0 blocks in 43.0 minutes per game…Shot .540 from the floor and .889 from the foul line • Became the fourth player in NBA history to average at least 30 points and 10 rebounds through his first four playoff games, joining Bob McAdoo, Kareem Abdul-Jabbar, and Wilt Chamberlain. • Left Kentucky for the NBA after leading the Wildcats to a National Championship while being named the Final Four’s Most Outstanding Player in his freshman season • Won six of the seven major National Player of the Year awards, getting the nod from the AP, USBWA and Basketball Times, and capturing the Wooden, Adolph Rupp and Naismith awards • Led the nation in blocks (4.65 bpg), while leading the team in scoring (14.2 ppg), rebounding (10.4 rpg) and field goal percentage (.623) • Broke school and SEC records as well as the NCAA freshman record for blocks in a season (186)…Finished the season with 20 double-doubles, tops in the SEC and tied for the UK freshman record • Named SEC Defensive Player of the Year, SEC Freshman of the Year, First Team All-SEC, SEC All-Freshman Team and SEC All-Defensive Team • Winner of the 2011-12 Roy F. Kramer SEC Male Athlete of the Year • Averaged 13.7 points, 12.3 rebounds and 4.8 blocks in NCAA Tournament • Tied NCAA Championship game record for blocks (6) • Also grabbed 16 rebounds in that contest, vs. Kansas • In the Final Four vs. Louisville, posted 18 points (7-of-8 FGs), 14 rebounds and five blocks • Contributed 18 points (6-9 FGs), 11 rebounds, six blocks and two steals vs. Baylor in the Elite Eight • Notched 15 points with 12 rebounds and five assists in a win over Iowa St. • During the regular season, tallied a career-high 28 points on 10-of-11 shooting, 11 rebounds, five blocks and two steals vs. Vanderbilt • Had a career-high 18 rebounds, along with 14 points and five blocks vs. Chattanooga. 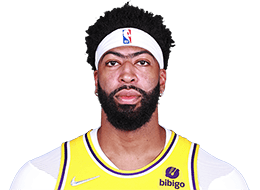 • Has received the NBA Cares Community Assist Award twice (March 2016; January 2015) in recognition of his charitable efforts throughout New Orleans • In 2014 launched “AD’s Flight Academy” which consists of monthly events with various groups in the Greater-New Orleans area during the season • Provided over 3,700 tickets to underprivileged children to attend a Pelicans game during the 2017-18 season • Hosted his first annual basketball camp in New Orleans in the summer of 2017 • Served Thanksgiving dinner to hundreds of underprivileged families at New Orleans Mission • For the holiday season, took over 200 children from local nonprofits and gave them their very own shopping spree at Target • Gave a mother of two from the local Kingsley House the brand new Kia he was awarded for winning the 2017 NBA All-Star MVP…Averaged 12.3 points and 6.6 rebounds for gold medal winning Team USA at 2014 FIBA World Cup • Member of the 2012 U.S. Men’s Olympic basketball team that captured the gold medal at the 2012 London Summer Olympics, averaging 3.7 points and 2.7 rebounds in 7.6 minutes per game while shooting .647 from the floor for Team USA • Averaged 32 points, 22 rebounds, and seven blocked shots as a senior at Perspectives Charter High School in Chicago • Named Co-MVP of the Jordan Brand Classic All-American Game with 29 points, 11 rebounds, and four blocks • Registered 14 points, six rebounds and four blocks in the McDonald’s All-American Game…Posted 16 points with 10 rebounds for the USA team in the Nike Hoops Summit • One of four finalists for the Morgan Wootten National Player of the Year Award and five finalists for the Naismith Award • A Parade first team All-American • Named all-conference three consecutive years while in high school • Stood just 6-3 at the start of his junior year of high school before a growth spurt took him to 6-10.